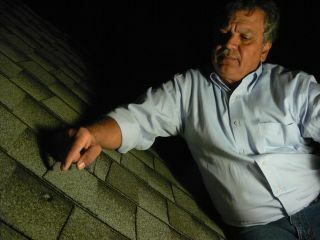 The dent in a roof caused by a meteorite from the Oct. 17, 2012, fireball over Northern California is identified by Luis Rivera, the neighbor of Lisa Webber who found the meteorite after it struck her Novata, Calif., home. A meteorite from a fireball that lit up the night sky over Northern California last week hit the roof of a Novato house and landed in the backyard, scientists say. Homeowner Lisa Webber, a nurse at the University of California, San Francisco Medical Center, found the space rock Saturday (Oct. 20), after reading an article about the dazzling Oct. 17 fireball in the San Francisco Chronicle. She recalled hearing a sound on her roof the night the meteor was reported and went searching behind her house, where she found a 2.2 ounce (63 grams) stone. Webber contacted Peter Jenniskens, head of the CAMS (Cameras for Allsky Meteor Surveillance) project, which is jointly run by NASA and the SETI (Search for Extraterrestrial Intelligence) Institute. The CAMS project put out a public call for information on possible meteorite sightings soon after the fireball last week. However, Jenniskens ultimately identified the rock as a meteorite. The stone, he reports, is dense and responds to a magnet, although scientists recommend not bringing magnets near suspected meteorites to avoid disrupting their natural magnetic fields. Jenniskens and Webber's neighbors Luis Rivera and Leigh Blair inspected the house's roof and found a small dent consistent with the rock having hit it from a southwest direction. The stone, which is a mixture of light and dark material, appears to be breccia, a composite made of mineral and rock fragments bound together. The meteorite's discovery helps scientists define the trajectory along which the meteor fragments fell. The path began east of San Rafael and continued over west Novato, toward Sonoma, Jenniskens said. He hopes the find will help the CAMS team uncover more meteorites from the same fireball soon. "The significance of this find is that we can now hope to use our fireball trajectory to trace this type of meteorite back to its origins in the asteroid belt," Jenniskens said. The fireball was seen at 7:44:29 p.m. PDT (10:44 p.m. EDT) by many people in the San Francisco Bay Area, with numerous observers catching the blaze on cell phone cameras and videos. The fireball also created a loud sonic boom that was also reported by witnesses. It occured just days before the peak of the annual Orionid meteor shower over the weekend. The CAMS team "obtained two views of the fireball track, one by our regular 20-camera station, the other by the single-camera station at San Mateo College," the scientists wrote. "We propose the name Novato meteorite, pending approval by the Meteorite Nomenclature Committee," they added. Editor's Note: If you snapped a photo of Wednesday night's dazzling meteor and would like to share it with SPACE.com, please send images, comments and your location info to managing Editor Tariq Malik at: tmalik@space.com.